This is a love novel based in London and to a smaller extent in Malta during the first years of World War II. Both places were submitted to all the force of German bombing and suffered very extensive damage and much loss of life in London but less in Malta because of our mostly very effective rock-hewn shelters. The main characters are Mary Norton, very upper-class and daughter of an MP, and the two men with whom she successively falls in love, both of whom are shown as somewhat socially inferior to her: Tom, a middle-level official in Education; and Alistair, a conservator at London’s Tate Gallery who is also very handsome. When war breaks out in 1939 the 18-year-old Mary volunteers to help the country in its war effort, but finds herself teaching primary school children. For her generation she is unusually not in the least racist and, when children of school-going age are evacuated to various parts of England, she finds that a number of them, including a clever but dyslexic black American boy, do not find decent homes ready to take them and come back to London. She resolves to go on teaching them in a school building allocated to her by her immediate boss, Tom, who falls in love with her and with whom she also falls in love. Her parents disapprove of this relationship with a man they see as unsuitable and, like their peers, are shocked to find out how affectionate she is to Zachary, the little black boy. 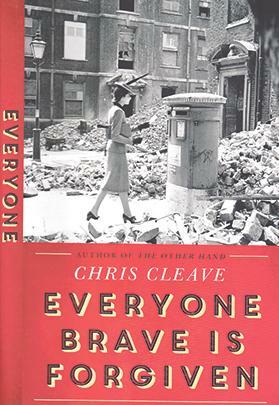 Cleave emphasises the depth of aversion of most Britons of that time to persons whom they persistently called “niggers”, with Mary finding that even the man she loves and her best friend Hilda share the common prejudice. In fact, her love for Tom begins to fade, and when she and Hilda meet a close friend of Tom’s, the charming Alistair, now already an experienced army officer, both girls immediately fall for him even after a fairly short meeting. This occasion leads to many of the plot’s developments. Alistair, an artilleryman, gets immediately shipped off with his battalion to a Malta beleagured by the Italian and German air forces. When Tom dies in an air raid that also kills most of Mary’s pupils (but not Zachary), Mary feel free to hint at her love in the few letters she writes to Alistair and that manage to reach him, and he himself has been greatly smitten by her. This is in some ways an old-fashioned love story both in its development and in Cleave’s prose style with a good many dialogues being reminiscent of some English fiction of the 1940s. Some readers may find it a little difficult to see how this long-distance love affair conducted in a terrible war in which both London and Malta are being mercilessly pounded is kept so much alive. Moreover, in Malta Alistair gets badly wounded when trying to save a downed German pilot from being brutally killed by furious Maltese, while in London Mary, who with Hilda has been busy in ambulances succouring the wounded and taking away the civilians killed in the great blitz, nearly dies in a flooded basement. She owes her life to Hilda who, however, has become hostile to Mary for being a successful rival for the love of a man who, for no solid reason, she considers to belong to her. Until the London blitz has ended, Mary tries to carry on with her teaching of Zachary and other black children to the disgust not just of her parents but also of anyone who comes to know of it. The wounded Alistair finally manages to get back to London and the two lovers find each other. Cleave makes it clear that the suffering both have gone through during the long time they have been parted has affected their feelings but not destroyed them, and Mary’s devotion to helping her fellow men of all classes and races has certainly not disappeared. Maltese readers will find fairly little about Maltese civilians’ privations and sufferings during 1941 and 1942, since the war in Malta is seen almost entirely from the English soldiers’ point of view. In fact, the only time when Maltese civilians are brought right into the picture is in the graphically and gruesomely narrated episode of the attempted lynching of the German pilot, the enraged Maltese people being contrasted with Alistair who is seen as more civilised and also a professional warrior face to face with an enemy of the same profession. The only large-scale war episode in Malta Cleave narrates is the arrival of the crippled HMS Illustrious entering Grand Harbour under constantly fierce air attack, with Alistair’s guns in Fort St Elmo putting up some defence, but he does not go on to narrate that the relentless air attacks on the aircraft carrier were kept up for several days when she was in harbour, raids in which Vittoriosa and Senglea were largely destroyed. Cleave also gives the impression that in January 1941 Malta had no fighter defence, whereas it did have some, though inadequately few, fighters and not just anti-aircraft guns. The narrative of London during the blitz is more vivid and is clearly based on much better knowledge. The adventures and misadventures of the poorly equipped ambulance crews are told vividly though some of the characters are not strongly characterised. Mary, however, is certainly the only character that has remained imprinted in my memory: the emotional upper-class girl who is drawn to serving the community even more than she is drawn to sexual love. This novel is likelier to appeal to older readers than to young ones. The book itself is beautifully printed, and well bound, and the dust-jacket has excellent photos of a blitzed London street and a fearful one of an absolutely ruined Victory Street in Senglea.